Drug drop-off sites are not new, but this weekend New York joins Washington as the first two states to adopt a unified statewide drug take-back program for unwanted prescription and non-prescription drugs. Gov. Andrew Cuomo signed the law in July that takes affect Sunday. The New York State Drug Take Back Act requires drug manufacturers to develop, implement and pay for a unified statewide collection system that is geographically distributed in urban, rural and underserved areas. It also requires retail and mail-order pharmacies to participate, but drug manufacturers will cover the costs. State Sen. Chris Jacobs (R-Buffalo) co-sponsored the measure in his role as Co-Chair of the Joint Senate Task Force on Heroin and Opioid Addiction. Drug drop-off sites are not new in New York, but starting Sunday, a unified statewide system is required by law. "I know this is going to be a burden on the pharmacies and others that are dealing with this, but we all have to assume responsibility and accountability and I think the drug manufactuers have to do their part," Jacobs said. "We are really in an unprecedented crisis in terms of the opioid epidemic, so we need all hands on deck." Jacobs told WBFO a statewide collection system will not only go a long way to eradicate the opioid epidemic, but also keep drugs out of our waterways, where they can turn up in fish, plantlife and drinking water. "The issue with the environmental crisis, in the amount of prescription drugs and drugs in general that are getting into our waterways, is really alarming," he said. "You know, our sewer systems were not made to be able to process those, so we need to find many ways to avoid them getting into the toilet or the sink or wherever, because those get into our food chain." Vitamins, supplements and other herbal remedies are not included in the program, but public education and the tracking of drugs until their eventual destruction are. Each violation of the law can result in civil penalties up to $10,000. Jacobs said government and law enforcement agencies have been picking up a lot of the costs of drug drop-boxes for many years. The new statewide system is expected to not only prevent medication misuse, but save taxpayer dollars. "We've done a lot of drug take-back efforts, where we coordinate with local police and provide a day where folks can come, usually at a police station or a firehouse, and drop their prescription drugs off," Jacobs said, "and I'm always amazed at how many people come by and the amount of drug items that come in the tonage." Drug manufacturers have until early July to submit their proposed plans. Each year, they are also required to submit an anjnual report to the governor, Senate and Assembly detailing all program activities. A State Program aimed at reducing medical waste in the environment is also helping to keep used needles and old prescriptions out of the wrong hands. 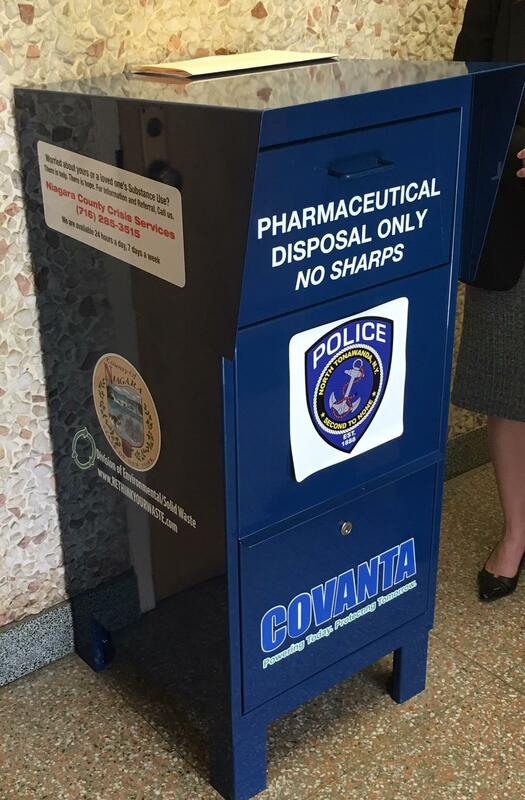 To help fight the prescription drug epidemic, Niagara County is making it easier to dispose of old medications. Kenmore police chief Peter Breitnauer has been arrested Friday and charged with criminal possession of hydrocodone.